I wake up for the first time in Newtown, Connecticut one week after one of the most horrific massacres in our nation’s history. My husband’s dear childhood friend, David Atkins, asks if there are any art supplies I need for the child therapy space at the Sandy Hook Healing Project. As I hand this to him (bear in mind the entire scene is thrown together in a few days and nights including my invitation and arrival) I suddenly think… I wonder if he will really search for hearts and bubbles? I have a quick bite and hustle off for my second day directing the Child Therapy Space for Heather Gunn-Rivera’s Sandy Hook Healing Project. How am I so quickly integrated? Heather is the daughter of Leslie Gunn, the art teacher at Sandy Hook Elementary for the past twenty-nine years. The Gunn family are friends and neighbors to David and Virginia for nearly twenty-seven years. So here I am, board-certified, licensed with a background in child crisis intervention, and experienced in acute art therapy assessment for all ages. I am at the Sandy Hook Healing Project early Sunday morning to re-organize the child therapy space quickly and maintain the most therapeutic atmosphere possible. Truly innovated so instantly, the Child Therapy Space is magnificent. 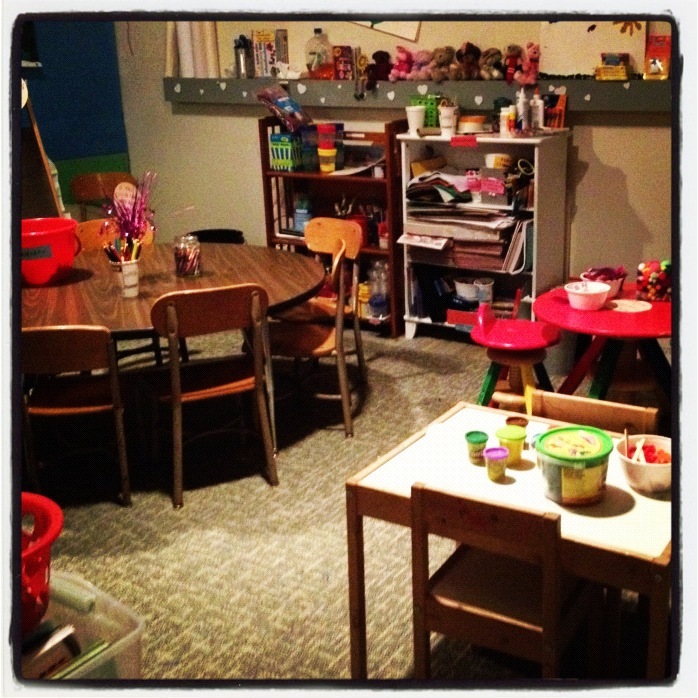 Thanks to donations, art teachers, and volunteers, the space is organized to facilitate a painting station, drawing, manipulatives, and collage; as well as sculpture, clay play, house play, and a cozy corner full of plush stuffed animals and therapeutic books. Young children share thoughts of reborn tigers, strong lions, bright pigs, dark alligators, and quiet bunnies. They add safe docks, tall mountains, calm seas, deep jungles, and bright sunshine. How does this indicate health and well-being? Many layers and indicators unveil through the art therapy lens. Observing each child and guardian display unique methods of self-expression, my role evolves to facilitate a healthy, grounding space to maintain and uplift a sense of safety among the visitors. The Sandy Hook Healing Project exists to provide first response healing as a bridge to the next therapeutic phase of crisis intervention. The intent is to embrace the community while long-term therapeutic supports are developed. Before I start this day, David enters the Child Therapy space bearing a bounty of the popular materials and inspirations list. He begins uncovering pom-poms, feathers, non-toxic paints, no-spill proof containers until finally a set of twenty five pink bubbles with heart-shaped wands emerge from the bags. Bubbles, to the rescue. Upon an initial session, one young child seems traumatized. Entering the child therapy space playing on an ipad, the kindergartner, with a choice between a two or four minute countdown, accepts two more minutes on their personal toy before joining the art therapy routine. The child seems uninterested in the art processes offered, then chooses building with legos while two young peers play in neighboring areas. The child appears quiet and isolated, as the other children depart, I turn to the young one and offer a choice: the animal task or bubble blowing? The youngster grins. Fast observing the child’s response closely, I mirror the child’s emerging happiness. From this moment in this art therapy session a bubble of trauma seems to pass through this one child’s mind. By being guided through non-verbal communication and the memory process with “hearts and bubbles”, this child may be gently touching on a therapeutic process of reframing the traumatic memory. As the children leave they are given a choice of a transitional object based on their interests. This child chooses to take some hearts and bubbles home, visibly happy and light-hearted. All who make art are given the choice to take their work or leave it hanging in the space to be protected for their privacy and future therapeutic process. Is this Art Therapy business some sort of joke? How silly are pom-poms and feathers? Well, clinical art therapy is a scientific, evidence-based therapeutic process that is profound and bounding with healing qualities. Who thinks of hearts and bubbles opening up channels to curing trauma and healing an unspeakable sadness? Even in the face of such unanticipated trauma, the human mind can find release and relief as a bubble floating from a wand. 15 Jan	This entry was published on January 15, 2013 at 2:38 am. It’s filed under Mental Health Articles, Sessions and tagged #Sandy Hook Healing Project #SandyHook #Newtown #arttherapy #crisisintervention #ptsd #acute trauma. Bookmark the permalink. Follow any comments here with the RSS feed for this post.